Also serving communities of Shafter, Taft, Wofford Heights. The average cost of assisted living in Bakersfield is $2,760 per month. This is lower than the national median of $3,346. To help you with your search, browse the 87 reviews below for assisted living facilities in Bakersfield. On average, consumers rate assisted living in Bakersfield 4.2 out of 5 stars. Better rated regions include Tehachapi with an average rating of 5.0 out of 5 stars. Caring.com has helped thousands of families find high-quality senior care. To speak with one of our Family Advisors about assisted living options and costs in Bakersfield, call (855) 863-8283. Promotion ends in 8 days! Golden Age Care Facility, Inc.
Over 380,0000 people call Bakersfield, California home. About 9 percent of them are seniors, age 65 and over. This town in the southern Central Valley of California offers seniors an antique district, museums, art and cultural events and more. The 39 assisted living facilities in Bakersfield are regulated by the California Department of Social Services and are licensed as Residential Care Facilities for the Elderly (RCFEs). These communities provide room and board and 24-hour assistance to seniors while fostering independent living. Personalized care can include assistance with daily living activities, specialized care for dementia and developmental disabilities and medication assistance. Bakersfield summers can be very hot, with temperatures sometimes reaching highs of 105 degrees. This may cause issues for seniors who enjoy outdoor activities. The humidity in this area is low during summer, however, and winters tend to be mild though slightly more humid. Air quality in Bakersfield is poor due to emissions from agriculture and oil refineries in the Central Valley. The city has ranked worst, second worst, and third worst in three categories for air quality. Seniors with respiratory illnesses may have difficulty living in this area. The cost of living in Bakersfield is 7.4 percent higher than the national average, although it is more affordable than many other cities in California. Seniors looking for safe and convenient transportation services in Bakersfield have several options, including Golden Empire Transit, a public transportation system that provides reduced fares for seniors. CTSA provides door-to-door shared transportation Monday through Friday for seniors over 60 who need rides to doctor appointments, shopping, and community centers. Get Bus offers reduced fare transportation to seniors over 65. The Bakersfield area is home to world-class medical facilities including the Bakersfield Heart Hospital, Adventist Health, and Bakersfield Memorial Hospital, in the event of medical emergencies or illness. Bakersfield has an array of community resources for seniors including Senior Nutrition, an organization that provides meals to seniors at various locations in Bakersfield and throughout the county, as well as three senior centers. Assisted Living costs in Bakersfield start around $2,760 per month on average, while the nationwide average cost of assisted living is $4,000 per month, according to the latest figures from Genworth’s Cost of Care Survey. It’s important to note that assisted living rates in Bakersfield and the surrounding suburbs can vary widely based on factors such as location, the level of care needed, apartment size and the types of amenities offered at each community. 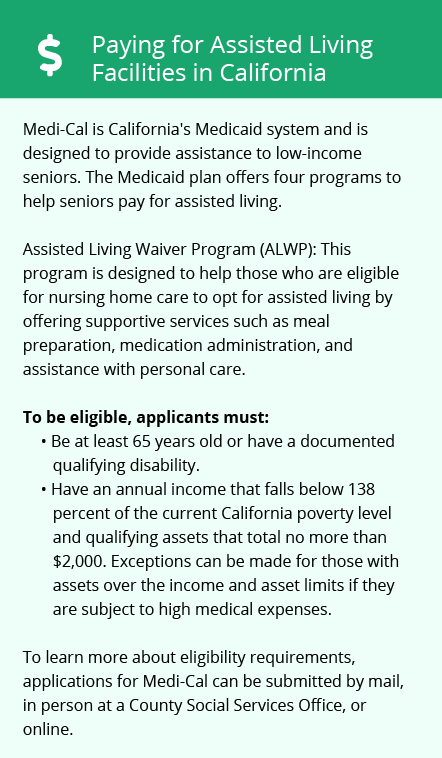 Bakersfield senior residents may be eligible for financial assistance through the Medi-Cal Assisted Living Waiver Program and In-Home Supportive Services (IHSS). Veterans may be eligible for assistance through the VA Aid and Attendance Program and eligible seniors can apply to receive an eldercare loan through Elderlife Financial. 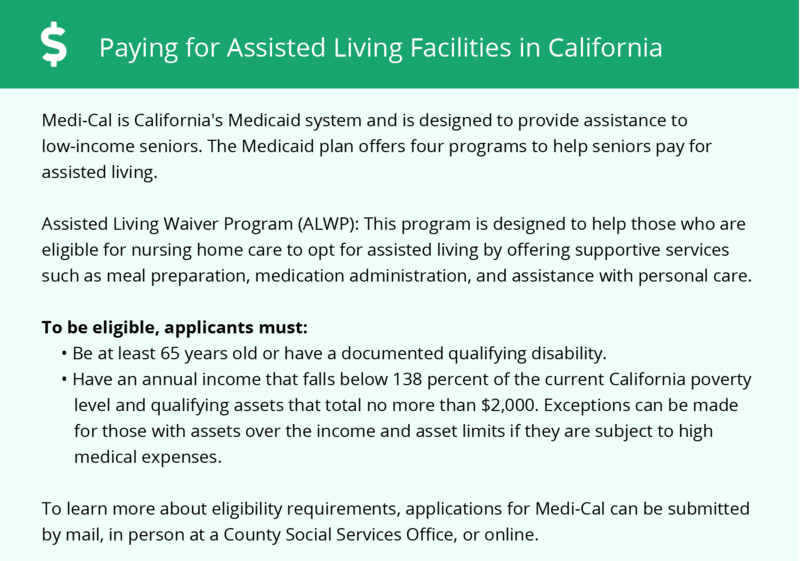 Learn more about these programs, plus who’s eligible, on our Assisted Living in California page. For more information about different ways to finance assisted living, visit our Assisted Living in California page. Bakersfield and the surrounding area are home to numerous government agencies and non-profit organizations offering help for seniors searching for or currently residing in an assisted living community. These organizations can also provide assistance in a number of other eldercare services such as geriatric care management, elder law advice, estate planning, finding home care and health and wellness programs. To see a list of free assisted living resources in Bakersfield, please visit our Assisted Living in California page. Bakersfield-area assisted living communities must adhere to the comprehensive set of state laws and regulations that all assisted living communities in California are required to follow. Visit our Assisted Living in California page for more information about these laws.